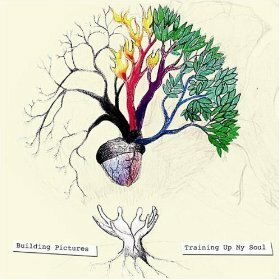 Building Pictures is the musical identity of John Gribbin, a Northern Irish singer/songwriter who has brought his craft to Brooklyn. Though only in his mid-twenties, Gribbin is on his fifth EP with Training Up My Soul. A departure from his earlier material, this release is his first to be fully penned in New York and the first to feature a full band, including his older brother Ciaran Gribbin (Joe Echo, INXS). The genius of Training Up My Soul lies in its simplicity. Each of the four songs has a clear focus on acoustic guitar and Gribbin’s voice, unpolished and affected so there is no doubt he’s felt everything he sings. These Americana/folk roots are embellished with just enough electric guitar, piano, and drums to fill out the tracks. The album’s namesake is surprisingly raw, with the grit of Gribbin’s voice giving way to melodic “whoa”s that build to an intuitive singalong. “Come of Age” has a clever pop edge, appropriate for a song about looking ahead to maturity. “You Took” is delightfully upbeat for documenting the dissolution of a dysfunctional relationship, which leads perfectly into the slow, snaking “Running Out.” Recorded in one take, the closer has an almost voyeuristic quality, from the improvised jam to the painfully honest lyrics. Though only a studio EP, Training Up My Soul has an energy that replicates live performance. This is meant to be heard not just over headphones but in person, and hopefully this will be the one to let Gribbin bring his tunes to a wider audience.